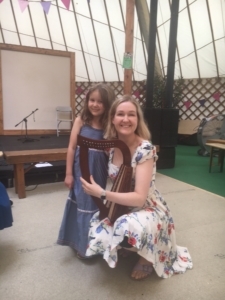 I held a harp workshop a the Eisteddfod in the Ty Gwerin (Folk House) tent. Lots of children turned up to have a go on one of my little harps. They all had a go at learning a Welsh tune ‘Mi Welais Jac y Do’ or ‘Seren Fechan’ (Twinkle Twinkle little star). We all enjoyed and I was fortunate to be able to borrow a couple of extra harps from my friend Meurig Williams as there were so many children who wanted to have a go! Here I am with my daughter Gweni at the workshop. 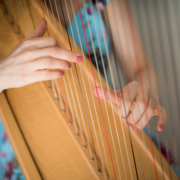 I have just finished a fantastic project with Pontypridd based Community Arts organisation, Artis Community creating a new piece of harp music with residents of The Hollies Care Home, Cilfynnydd. It’s been a fantastic project and experience. We’ve had a lot of fun and a lovely piece of music called ‘memories of water’ was created, that inter-weaves the residents voices speaking about past holidays to the accompaniment of harps and percussion. The whole piece was recorded live at the care home.